The Government must recognise the limitations of taxing the self-employed and must take note of the social security and health-care needs of this group, particularly in their old age. At the same time it must extract some surplus from the well-off segments of the self-employed. Effort is needed to set up old-age homes and hospitals using the surplus of the self-employed rather than using only the instrumentality of income-tax. THIS IS that time of the year when the Finance Minister is flooded with suggestions on taxation. We look at the structure of taxes among different categories and find that the self-employed have neither Medicare nor pension facilities crucial particularly in old age. It is high time the income-tax aspects of the self-employed were re-visited and perhaps modified and innovative instruments introduced to make their surplus available to the community at large. There has been an important development in the economy’s savings rate but not adequately appreciated by business papers or economists. The self-employed category has contributed significantly to the economy by its savings, particularly in the context of the low interest rate regime in the last few years. In the 1960s, the country’s savings rate used to be 8-10 per cent of GDP and the theory of vicious cycle of poverty — low savings rate-low investment-low income-low savings — became popular, using India as an example. From the 1980s, the savings rate has risen significantly and was around 20-24 per cent through that decade and the 1990s. It was 28 per cent last year. The single largest contributors to savings are the household sector. Proprietorship and Partnership firms (P&P sector) — the entire self-employed category — is treated as part of the household sector in our savings data. In other words, when we talk of household we need to remember that it contains both pure consuming or wage earning units as well as mixed households having production activities. Hence, whenever household saving is mentioned, we need to be alert to the fact that it contains that of P&P firms performing manufacturing and service activities. Gross domestic product at factor cost at constant (1993-94) prices in 2003-04 is estimated at Rs 14,30,548 crore against Rs 13,18,362 crore in 2002-03 registering a growth of 8.5 per cent against 4 per cent during the previous year (Central Statistical Organisation Quick estimates 2003-2004). At current prices, GDP in 2003-04 is estimated at Rs 25,19,785 crore against Rs. 22,54,888 crore in 2002-03, or up 11.7 per cent. The GDP growth rate of 8.5 per cent in 2003-04 was achieved due to high growth in agriculture (10.3 per cent), trade, hotels and restaurants (8.8 per cent), financing, insurance, real estate and business services (7.1 per cent). Gross domestic saving (GDS) at current prices in 2003-04 is estimated at Rs 7,76,420 crore against Rs. 6,42,298 crore in 2002-03, constituting 28.1 per cent of GDP at market prices against 26.1 per cent the previous year. The rise in GDS was contributed by all sectors. In respect of the household sector, the saving in the form of financial and physical assets has gone up from Rs 5,74,681 crore (89 per cent of the national savings) in 2002-03 to Rs 6,71,692 crore (87 per cent) in 2003-04. Table 1 gives the share of taxes of different sectors for the assessment year 1999-2000 (accounting year 1998-99), the latest year for which details are available. Nearly 45 per cent of the tax burden falls on the self-employed consisting of P& P segments including non-salary groups. Actually the burden is much more for these groups since they also bear a substantial portion of service tax. The self-employed are active in (1) unorganised manufacturing, (2) construction, (3) wholesale and retail trade, (4) hotels and restaurants, (5) non-Railway transport, (6) real estate, ownership of dwellings and business services, and (7) other services. In these activities the share of self-employed, or the P &P, sector varies from 50 per cent to 90 per cent; on a weighted basis it is around 70 percent. Table 2 provides the share of the self-employed groups in GDP and also in taxes. It shows that they pay significantly higher taxes in relation to their share in the income. The self-employed has nearly 30 per cent of the share in GDP but more than 45 per cent share in income tax. 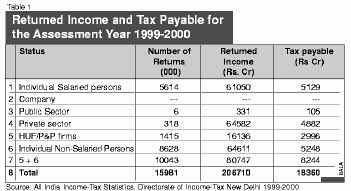 Their share of income tax to their GDP was 3.3 per cent in 1993-94 (100 basis points more) compared to 2.2 per cent for all categories. In the later period, 1998-1999, it was still higher by 50 basis points. But we know that substantial portions of the self-employed professionals such as doctors/advocates/architects are not adequately covered by income-tax. It is impossible under the existing structure to enhance the coverage and any attempt will only lead to larger corruption. The idea should be make available some share of surplus of these groups to the society at large. At the same time, the self-employed have grouse that neither they have medicare coverage nor any pension schemes. Government employees are covered by defined benefit, non-contributory, commutable, inflation indexed, and pension plans. They also have the family pension benefits. After 15 years of retirement the commuted portion is reverted to the retiree in computing pensions. Other than that they have gratuity, General Provident Fund, leave encashment, and leave travel facilities. For those who joined service after January 2004, the Government is thinking of introducing a contributory pension plan. Those employed in the organised sector also have the benefit of EPF (at 9.5 per cent rate currently) or other pension programmes. In the case of self-employed, they need to take care of themselves during their old age particularly in the context of decline in joint family system and low-interest rate regime. Unfortunately, even contribution to a pension scheme by a partner is not recognised as allowable expense of a firm unlike executive benefits provided by a company in this regard. One possibility will be to encourage self-employed to go for pension products offered by LIC, etc., and increase the threshold limit to Rs 50,000 from the current Rs 10,000 and tax them at the time of dispersal in the form of TDS. This would be easier operationally than trying to tax the estimated income currently. This would also provide social security to large group of self-employed. Similarly the contribution made by the self-employed to the construction and maintenance of old age homes can be exempt from taxes to the extent of Rs 1 lakh per annum and this will help in directly using their surplus to the socially needy cause. The old-age homes can offer discounts or free service to the current donors at the time of their old age. This will increase the pool of facilities available for the old age persons. In the case of government and organised sector employees, health-care facilities are available or reimbursements are made. In the case of self-employed, they need to take care of their requirements out of current income and savings and this is all the more difficult during old age in the context of lesser support from joint family system. Here, again the Government can think of allowing large health care expenses and premiums up to Rs 50,000 for tax purposes. The contributions/donations made by self-employed to clinics and hospitals can be exempt up to say Rs 1 lakh. This will increase the availability of funds in the health-care sector and the clinics and hospitals could evolve schemes to offer discounts/free treatments to such donors in future. Incidentally similar provision can be made for contributions to free meal schemes of temples or to educational institutions. It is important for the Government to recognise the limitations of taxing self-employed in a country like India with real issues of corruption. It is imperative that the state recognises that community efforts and social surplus are desirable goals. In other words, taxation is not the only instrumentality to benefit society at large or achieve top social goals. We need to find innovative ways to facilitate the social security and health-care needs of the self-employed particularly in their old age and at the same time achieve desirable social goals of extracting some surplus from the well-off segments of the self-employed. We require old-age homes and clinics and hospitals and good schools and hence efforts are needed to enhance the development of these using the surplus of the self employed rather than using only the instrumentality of income-tax. ← Contract enforcement — Whither time value of money?